As every summer I’m closing the house for three weeks from saturday August 10th to saturday august 31stth..so I’m looking for just the right family or group of friends to rent my home for that period. Except for a few days now and then Bruno and I will be just down the road at the farm if you have any questions and I have a gardener and a house keeper who will come to keep things tidy. The price is 2000€ for one week, 3000€ for 2 weeks. ! 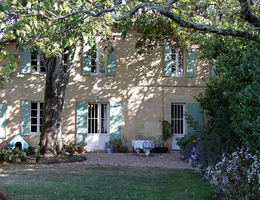 It sleeps 7 + a children’s room with 4 built in adult size beds (you can see the rooms on my B&B pages) and you can just move in and feel that you are French for the summer. Please pass the word along. Of course I’ll give priority to my former guests. The cottage can sleep 2 or 3 and is 600€ per week if rented on its own but only 400€ if rented along with the main house. HURRY AND RESERVE NOW !! 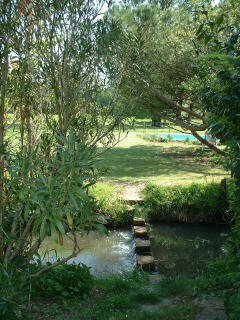 La Forge is an hour from the Atlantic ocean beaches and 5 minutes from our private family pool at our Pey Froment annex (1 mile away) …the photo shows the pool on the other side of the mill’s stream. PS if you want to stay connected there’s wifi in all the rooms. The cottage can be connected or not.